WDT has become the leading weather provider for offshore assets in the Gulf of Mexico. Our WeatherOps services, which include custom site-specific weather reports, hazardous weather alerts, and meteorologist consultation, aid decision-making and ensure the safety of offshore projects across the region. These services are particularly valuable during winter and spring when there are more frequent weather-related disruptions to daily operations. 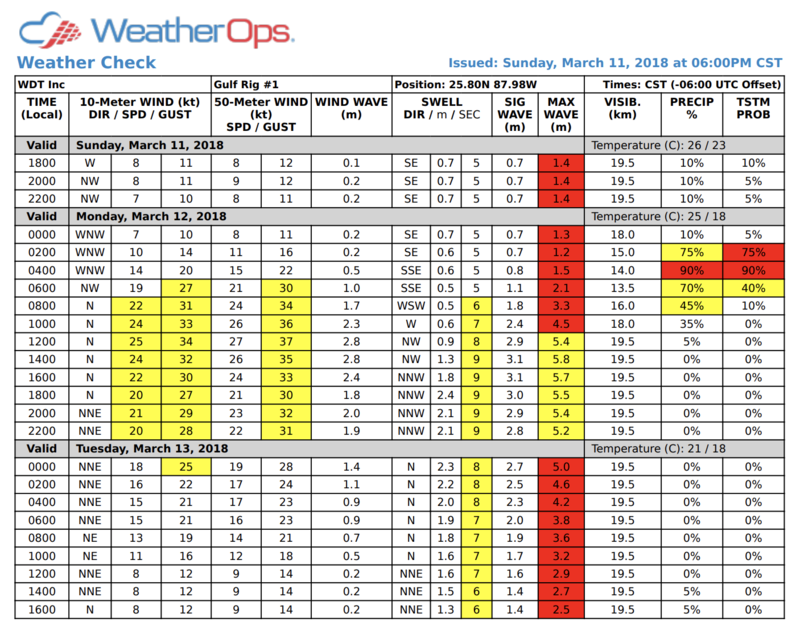 The Marine Daily Planner combines our meteorologists’ insights, specialized forecast algorithms, and high-resolution model forecasts to project wind and wave threats as well as the probability of precipitation/thunderstorms over the next seven days. Risks are identified using custom weather triggers set by clients in WeatherOps Commander. In the example below, yellow indicates 10m winds greater than 22 kts, 50m winds greater than 28 kts, and swell periods greater than 6 seconds. Red is signaling an 80% chance or higher of precipitation during the initial period. 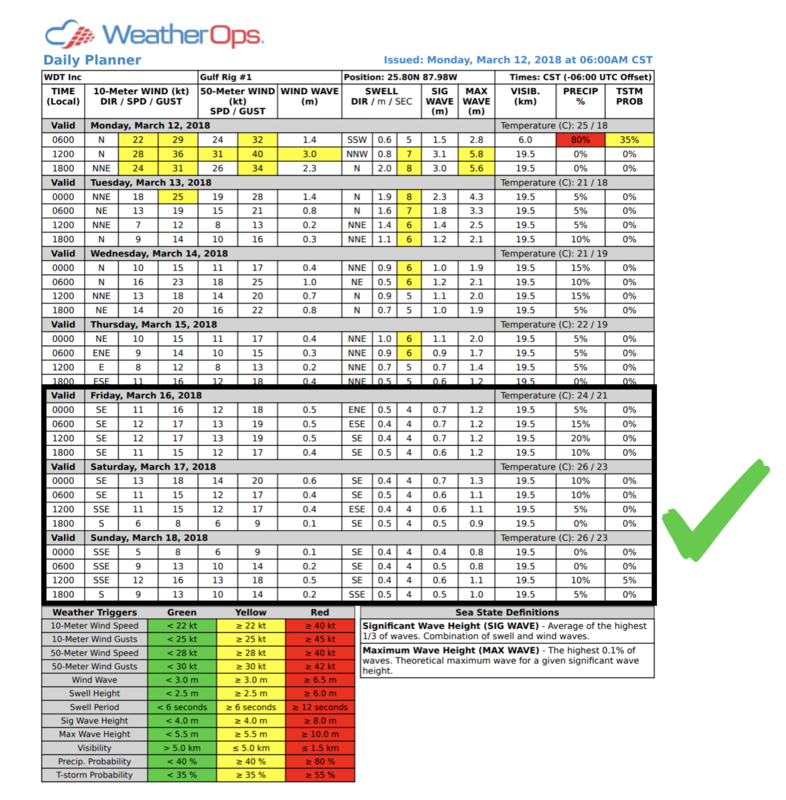 These color-coded thresholds provide a clear look at the best working conditions for your operation during the week ahead. Concerned about the arrival, duration, and severity of the next cold front? Receive a Weather Check to guide you through high-impact decisions during the next 48 hours in 2-hour increments. 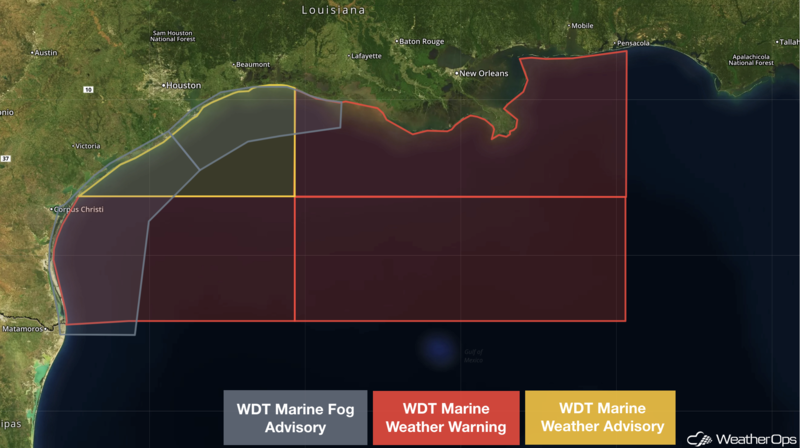 WeatherOps alerts provide advanced warning for numerous offshore hazards including low visibility, high winds, rough seas, and strong thunderstorms. These alerts are beneficial during winter and spring months when a higher frequency of cold fronts penetrate the Gulf of Mexico. Cold air surges cool continental shelf waters, bays, and coastal waterways, laying the groundwork for potentially long-duration dense sea fog events through spring. Sometimes areas of low pressure, referred to as Gulf Lows, develop along these fronts producing expansive areas of gale force or higher winds, very rough seas, and heavy squalls offshore. Early alerts for these weather systems allow companies to position crews, halt sensitive operations, and know where to ship supplies ahead of schedule. 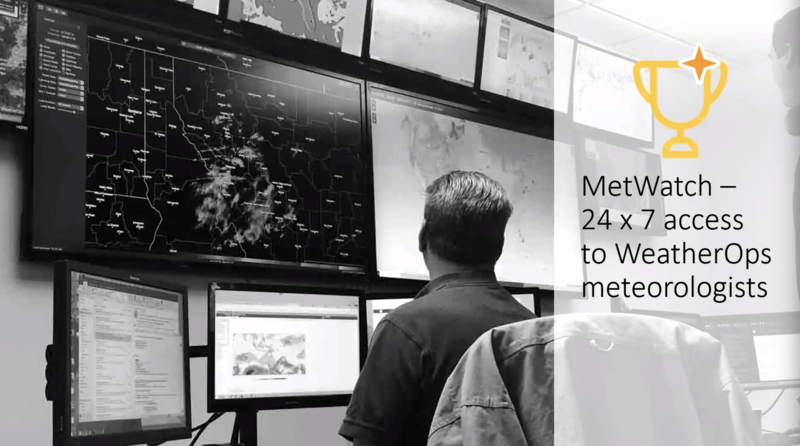 Our meteorologists are available 24/7 to provide weather support when you need it the most. When a strong cold front or squall line is on the way, we call your asset managers to explain the threats and answer questions about the latest forecast. Personnel safety, vessel positioning and repositioning, routing, and efficiency are all dependent upon weather conditions at any given time. We save companies millions of dollars in lost revenue due to weather disruption. Try a free 7-day trial and see how we can assist you.